Littorina littorea periwinkle snails from Quoddy Head, Maine. Photo by me. 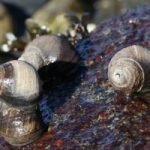 The New York Times online Science section published a short piece earlier this month by Joanna Klein about humming to periwinkles. People who grew up in coastal New England know this trick: To coax a periwinkle snail out of its shell, hum to it. Rick Wicklin contacted me with a helpful suggestion for improving the data presentation method outlined in my previous post on using ggplot2 to visualize some data. In the previous post I had plotted up a highly correlated set of points, showing the correspondence between maximum daily body temperatures of model snails sitting with the foot touching the rock surface, or withdrawn into the shell. 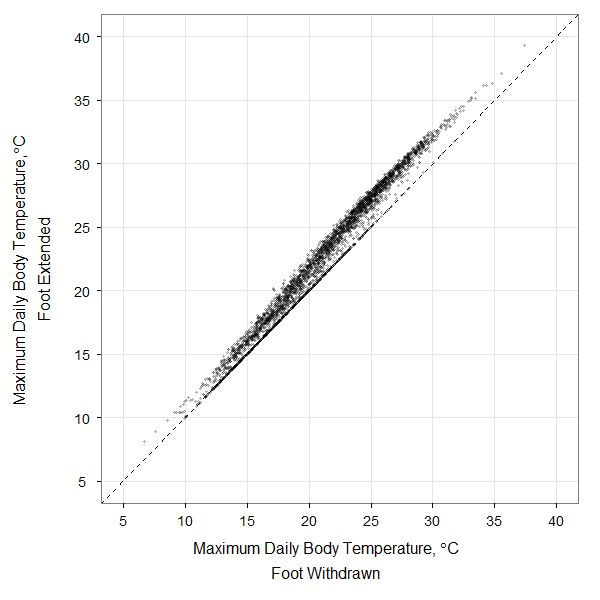 Here’s a bit of code used to produce one of the figures in my recent paper dealing with modeling rocky intertidal snail body temperatures. This was my first foray into ggplot2, and it only involved a few hours of head-scratching. The plot is a comparison of 10 years of daily maximum body temperatures of a modeled littorine snail sitting on a rock with its foot out on the rock or withdrawn into the shell. The original data are here: dailymax_runs139_169.